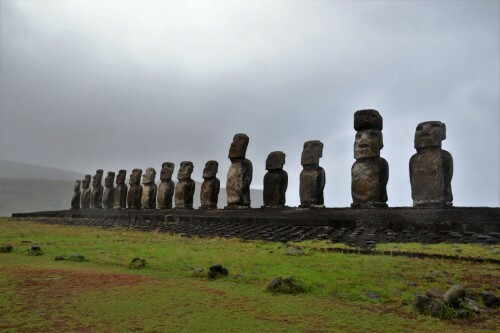 In our trip around the world, a stop on Easter Island was high on the list of countries we wanted to visit. But given the fact that it is in the middle of the pacific ocean with not a single other island within 2000 km, it is not just a bus drive away and thus required a bit of planning. 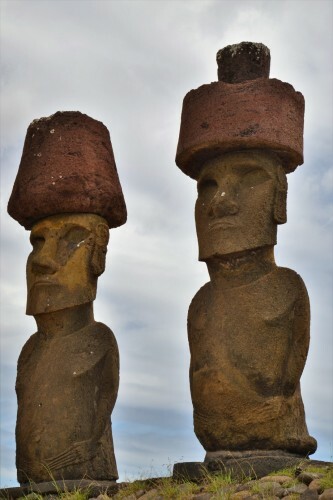 The only two ways to reach Easter Island is either a round trip from Santiago or via a flight from Tahiti. That was actually the main reason why we made a stop on Tahiti and went to Moorea. As you can see in our previous blog, we’re so glad we did. 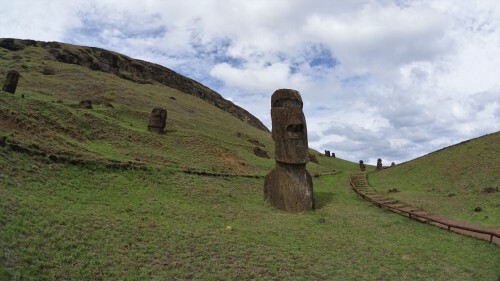 Easter Island or Paaseiland (NL): Where does the name come from? Quite simple: apparently Jacob Roggeveen, who ‘discovered’ the island (in the western world’s perspective of course), landed there on Easter day. That’s it. No more, no less. He called it Paasch-Eyland, but nobody speeks 18th century Dutch anymore. Note: The indigenous people call their Island Rapa Nui. Arriving in Easter Island the only things that we knew was that it is a small island in the Pacific and that it has these statues facing the sea. The first thing was correct, but the second was wrong. The statues don’t face the sea, but are facing inland . Next to this we had no clue what to expect. So what does the island look like? 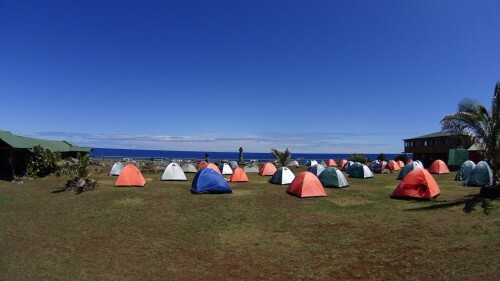 The first day we arrived around 2PM and was basically our ‘settling’ day with unpacking at the place where we stayed, installing our tent, going to the ATM for our first Chilean Pesos and a walk around the town Hanga Roa. The world is a small place, that’s for sure. 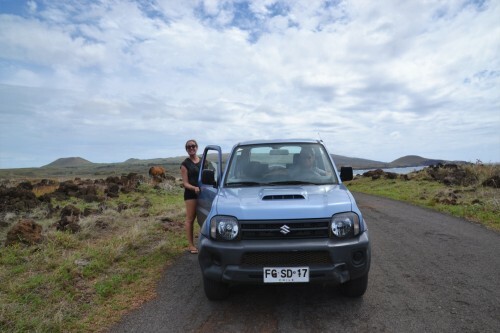 On the first day on Easter Island we met Marie, a nice French girl who is also travelling for several months and with whom we have spent our days on the island. That is not so extraordinary, we know, but we found out that she had met Margaux, another French girl, in Cambodia, with whom we have spent quite some time in Laos. Quite a coincidence, but possible. Later, it also appeared she had been traveling together with Maria for a week in Laos, an Argentinian girl, which we met another time on a trekking in Vietnam. Another coincidence thus, and if that was not enough, we apparently were even on the same plane from Singapore to Hanoi in October! It’s a small world after all. In the town we saw our first real Moai. Not to be mistaken with a dozen fake ones that are decorating hotels and restaurants. Hanga Roa is a very relaxing small town with some activity in (1) the main street with shops, supermarkets and restaurants and (2) at the coast with again some restaurants, bars, small beach with surfers and not to forget a football field where teams were practicing or playing every night! I don’t know how many teams there are on the island, but with 6500 people, I thought it was strange to see every night people training and playing. Anyway, on the day we arrived the weather was nice and after seeing our first Moai’s we had an extremely delicious dinner in probably the best restaurant of the Island, Te Moana. We had our first of (probably) many Pisco Sours and Ceviches in South America. Afterwards we enjoyed the local celebration of Dia de Mujeres (International Women’s day). 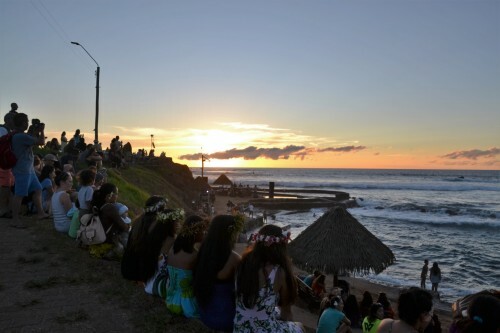 The atmosphere was very lively, with a local band -in Hawaiian camisas- playing tropical music, local woman -colourfully dressed with flowers in their hair- dancing, surfers conquering the waves in the background, and all this while the sun was going down. What a very nice vibe to start South America with! 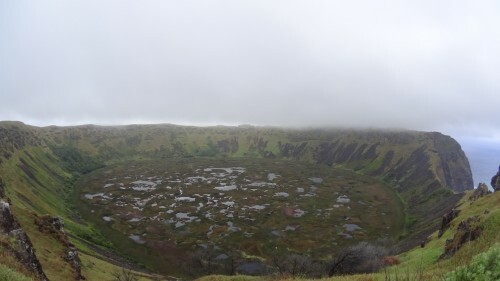 The next day the weather was very bad, but nevertheless we hiked up to the Orongo volcano and the ethnic village. Despite the bad weather and hence the limited views we learned a lot about the village and the ‘Birdman’ games. It was also good for practicing our Spanish: Céline was the guide who read the whole story in Spanish while Benjamin & Marie carefully listened and tried to understand everything (ok, we admit, we also read the English version afterwards to check if we understood everything well ). From this historical village you can see 2 small motu’s (islands) on which every season a specific bird species breeds. Every year the head of each tribe with his entourage + its ‘birdman’ (Tangata Manu) gather together in this part of the island for their own kind of Hunger Games. That’s not the real name, but anyway. It is a competition where each birdman climbs down the volcano cliffs, swims to the motu and waits in camouflage for the first nesting birds to lay their eggs. The birdman who brings the first egg of the season to its tribe leader, wins. The price was no doubt a very nice omelette… and probably also some prestige for the tribe. The next day we did a big tour around the island, with a guide. Unfortunately, it was pouring again and after the most awful night of our entire trip it was very hard to pay attention while the guide was explaining about the history of Easter Island. Which was a shame, because it was very interesting, but a rainy and extremely windy night in our tent was to blame. Céline slept less than 2 hours as the tent tried to hug us during every wind gust, while the tent canvas was getting wetter and wetter. TOP night! 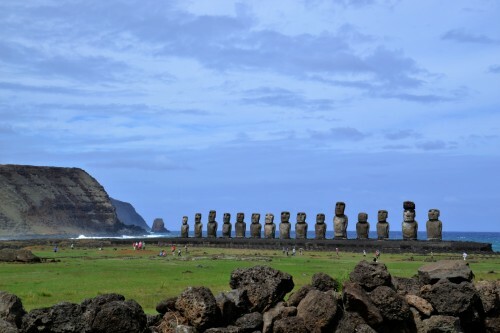 The Moai’s were built by the indigenous Polynesian Rapa Nui people and represent their ancestors. They hold the ‘Mana’ (spiritual power) and keep an eye on the community/tribe village & bring good luck. That’s actually the reason why they are not facing the sea, but inland to the town. 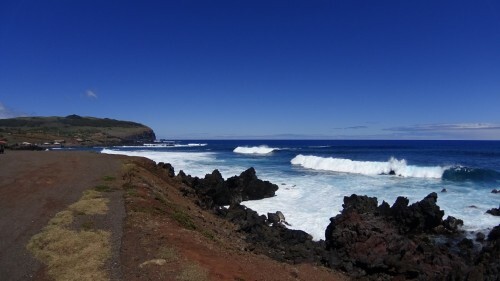 On the tour we visited many interesting places, including the quarry at Volcán Rano Raraku, the line of 15 Moai’s at Tongariki and the gigantic Moai’s on Anakena Beach. We also met nice people from Chile, Argentina, … including a mother and her son that gave us a ride the day before (we still got the hitch hiking bug from Moorea). Coincidence again?! Or just an extremely small island?! 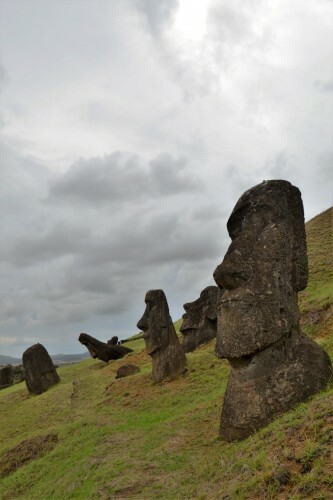 The Moai’s were made out of the volcanic stones and afterwards had to be transported for 5 to 14km! Given the size of the statues, it still remains a bit of a mystery how they did it back then. One theory says that the statues were literally “walking” as the villagers attached ropes at two sides and tilted them from side to side while pulling forward. Another theory is that they were placed on wood logs and were rolled to their destination. Pretty impressive if you know that the tallest Moai is 10 metres high and weighs 82 tons. 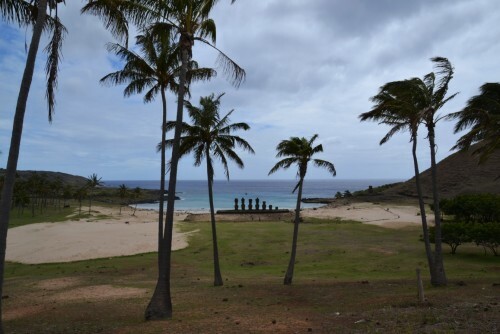 All of the upright Moai’s that we saw were restored, as at a certain time there wasn’t a single Moai standing anymore. 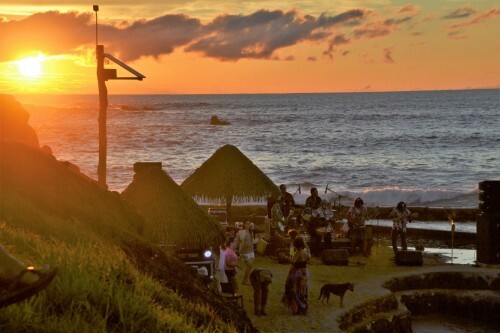 The Rapa Nui people were nearly extinct from a population of around 20.000 to only +/- 100! Again different theories about this society collapse: the main belief is the combination of events of (1) limited resources (food, wood, …), (2) tribes competing each other (fighting, but also making bigger and bigger Moai – and thus using more and more resources), (3) deforestation and land erosion and thus even less resources, (4) Peruvian ships taking slaves (half of the population) and bringing diseases to the island. 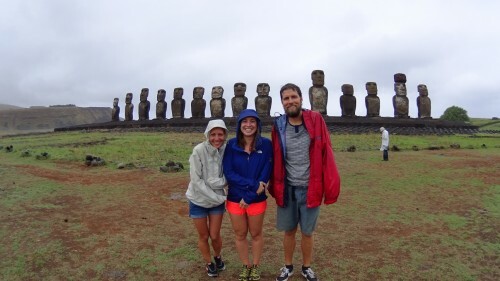 The main belief for bringing all the statues down were the internal wars, but our guide said that the indigenous people destroyed the Moai’s because they wanted to stop the Europeans/ships to come to the island (and take people for slavery, bring diseases, …). Still a lot of debate about it! If you like to read more about this, Jared Diamond in his book “Collapse: how societies choose to fail or succeed” dedicates a chapter to this island. What we liked the most was the Moai quarry, as this place appears to have been abandoned abruptly, with many completed Moai outside the quarry awaiting transport. Their heads peak out of the grass hill, very impressive! As we liked the sites so much, we decided to come back the day after, in better weather, with a small jeep (Suzuki Jimmy) that we rented together with Marie. 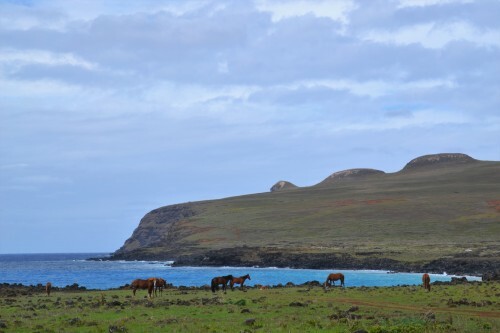 We took the pictures that we weren’t able to take the day before because of the rain, enjoyed exploring the island, seeing the wild horses on the desolate roads & fields, Benjamin tried Jimmy’s off-road skills, … Great day! 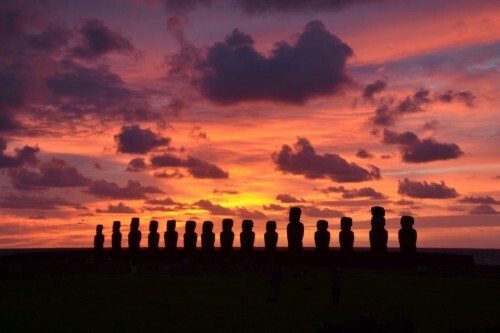 And it even got better in the morning when we used the car to go and see the sunset at the largest site (the 15 Moai’s at Tongariki) which was really a magical experience! 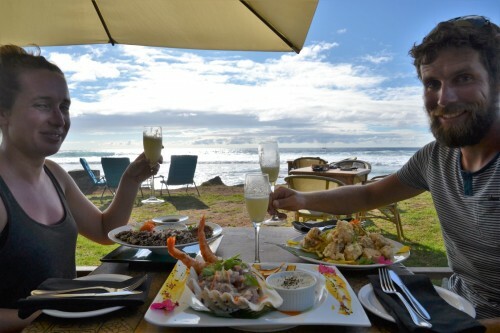 A goodbye dinner on our fifth and last day in our favourite restaurant made our stay in Easter island complete and we were ready for our night flight to Santiago. Céline slept a bit during the day to recover from the wind hugs a few nights before, Benjamin slept a bit to be awake enough to see at least 1 movie during our 5hour night flight 😉 . 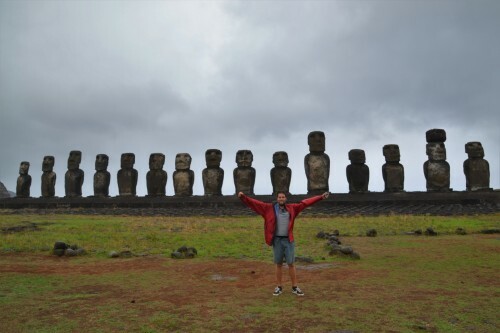 Easter island, you were great! ← Moorea: Un vrai paradis!